communities on scenic route 392. 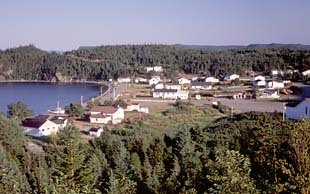 "A little fishing community on the north side of Halls Bay, Beachside was one of the earliest places to be settled in this region. 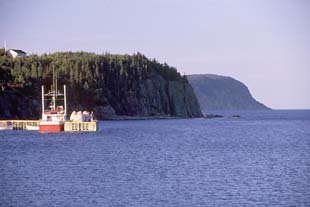 It was first listed in the 1857 census as Wild Bite and later as Wild Bight. This name apparently sprang from the settlement's total exposure to the ocean on one side." "Beachside, a community surrounded by hills on three sides with the fourth boundary open to the ocean, is a place of amazement in spring. Often one can gaze out over Backcove Hill and see huge masses of ice, in many spectacular shapes, floating across the bay. This area is lush, colourful and beautiful in summer when the flowers are in bloom and the sea is aguamarine, calm and serene. In the fall an angry sea frequently sends its spray upon the beach and the cold wind seems to go right through those brave enough to stand in the open. 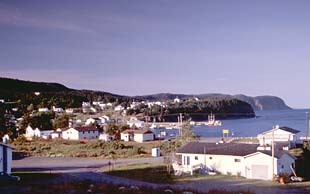 Beachside changes again in winter, with snow-capped hills, and the bay sometimes frozen solid enough to allow snowmobilers to travel for miles across the water. One might even see a car driving across the bay. For the most part, Beachside residents say they appreciate their home, and they are proud of the contribution they have made to Green Bay over the years."